3 important notes for you to be aware of. It SHOULD be Compatible with other mods such as ProfitUI and EQ2Map. Since it's only a skin based on the standard components it really should be compatible with just about any mods out there. At least those using the same basic resources as the default skin. Read more about Merging mods under "INSTALL" and more about compatibility under "COMPATIBILITY". It's ONLY a Visual enhancement and will NOT effect your setup and how things work in-game. Since this is a skin and only contains image files it will NOT affect anything other than the visual part of the interface. Things will stay the same, but look different. You CAN customize what parts to use or not to use. This is a complete package but if there is anything you don't like about it you can customize what to include. Read more about customization under "INSTALL". 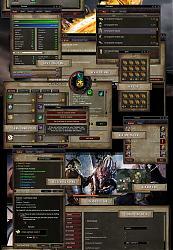 This is a user interface skin created by gurkoz based on the theme of the game Vanguard Saga of Heroes. 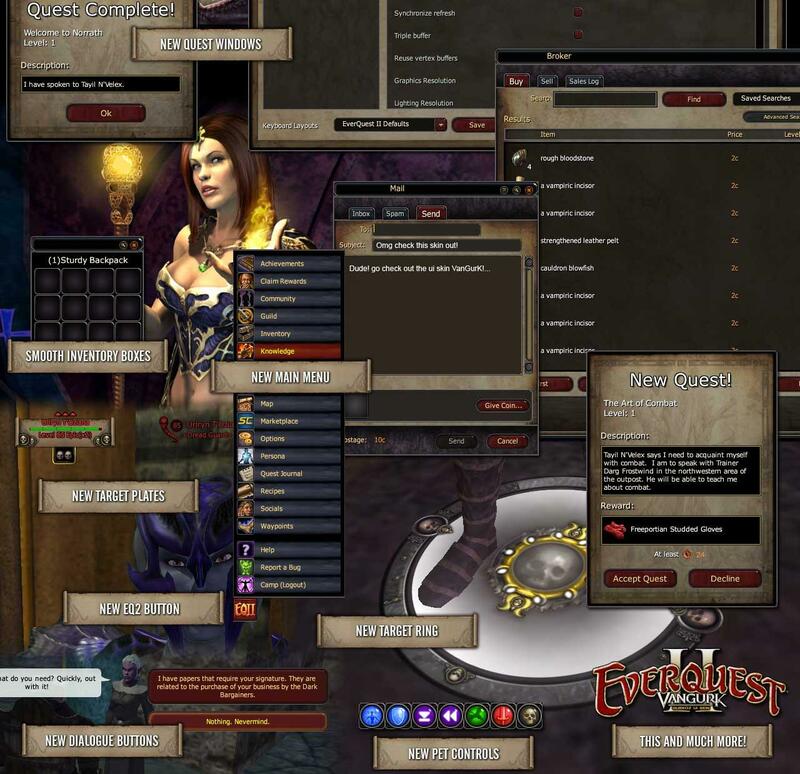 It is a complete re-skin bringing the best aspects of Vanguard UI to Everquest 2! Vanguard Saga of Heroes skin theme! Complete re-skin of all elements currently in use ingame! Crisp clean graphics in 32bit resolution! New Heroic Opportunities wheel with touched up symbols! New cool looking "Start" button! New Target info boxes complete with skulls representing toughness! New Main Menu with new icons! New Main icons with a rounded edge! New Mouse over effect on icons! New smooth backplate for icons! New Map Icons with better contrast and readability! PLUS much more including buttons, icons, frames, corners, bits and pieces! v1.05 - Updated the skin to the most recent version of the game.It's been a long while but it's finally up to date. v1.04 - Edited some extra resource files related to borders. - Re-skinned the progress bar. - Re-edited some elements in the target bar thanks to The-Order. - Plus some small changes and touch-ups. 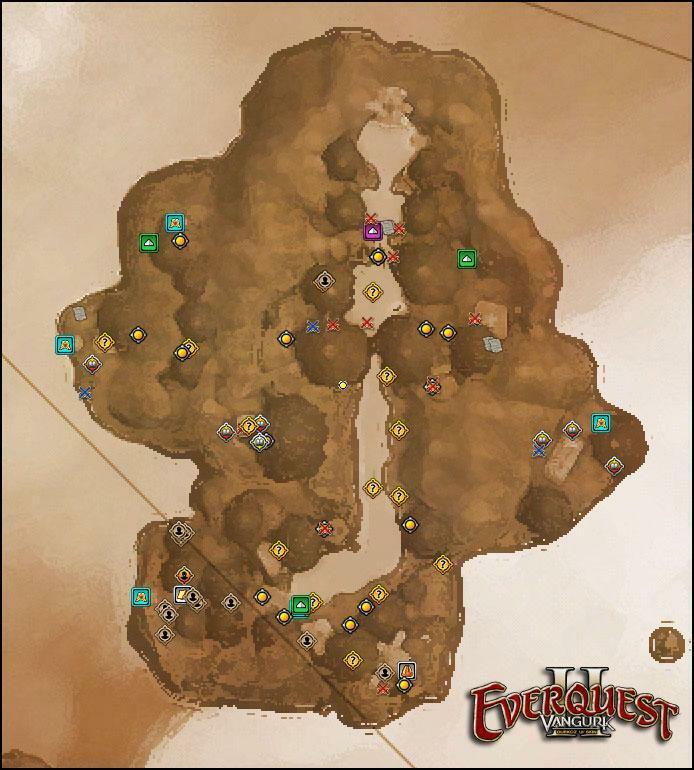 v1.03 - Swapped EQ2Map quest icons. This should better reflect on quest update icons. v1.02 - Re-sized the EQ2Map icons giving better visibility. This should provide a better view of the already crowded maps. - Re-sized the "spell-ready" animation and added fade in and out. The previous animation was more or less hidden behind the icon-box. - Re-sized and re-colored the "spell-queue" icon. This really is a great feature but it really needed to be more clear. As of now, spells put in queue waiting will flash with a yellow box. - New scrollbars for stuff using the old resources. Same Vanguard ui scrollbars on everything! - Added border on items when moving. This to better see the color coding of picked up items. - Added border on map icons when mouse over. A better way to really see what icons you are selecting. - Aligned the compass to better reflect numeric values. Someone pointed out that North was not really north. Should be now. - And a few other small improvements here and there. v1.01 - Added support for EQ2Map modification and new map icons. Unzip the contents of this file to your Everquest 2 folder. 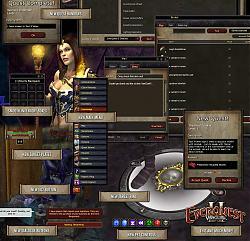 This will create the folder "VanGurk" in your UI folder and place a file called eq2.ini in your Everquest 2 root path. Please note, if you already are using another UI skin, your existing eq2.ini file will be replaced. If you need to edit your existing eq2.ini file be, sure to set these following lines. There is also an internal command to load UI's in-game using "/loadui" but the results are sometimes strange and incomplete. It is not really the best way and not recommended by anyone. To uninstall the mod just delete the VanGurK folder in your UI path. Also delete the eq2.ini file in your Everquest 2 folder. Or revert back to your previous eq2.ini file and setup. To merge this skin with your current enabled UI just unzip the folder named "images" to your existing UI path replacing all files. Please note, this could get unwanted results so please be careful. Knowing what files to replace is the best way to go. When unzipping the files you have the option to customize what parts of the skin you would like to use. If you like the skin it self but hate the icon changes, just skip the "icons" folder. I won't go into details about this since using an DDS viewer or reading filenames is self explanatory to select. It's up to you what to include and what not. Since this skin is based on the sole purpose of just replacing Image files and not altering any xml game-files, i am fairly convinced that it will be fully compatible with future versions. It might even be compatible with other mods but i leave that up to you to find out. It is confirmed that compatibility with ProfitUI and EQ2Map is good and i will enhance these aspects even more in future releases. I started this project when i recently returned to Everquest 2 again to see if there was anything for me in this long time runner mmo. I've played it before for a short period and i now remembered why i left. I just couldn't get over the fact that the interface annoyed me and made it impossible for me to focus on anything else. I immediately found a lot of areas that could use some improvements. In the end, the options where, to accept the facts or to do something about it. Of course the option to use other peoples ui mods where available but the really fun part was to create your own! Having previously played the trial of Vanguard Saga of Heroes, i felt there was something that could be done. Vanguard seemed like a nice game and all but it wasn't for me. And really, the best thing about it i found was the interface. A real work of art but sadly i couldn't continue playing only for the sole reason of a great ui. Going back to play Everquest 2 gave me great fun and incredible experiences but i never could forget how clean and crisp a nice looking ui could be. The idea of a Vanguard inspired skin for Everquest 2 was soon thereafter born. First i only did this to my own amusement and really just to be able to play the game without getting annoyed by the default skin. Later i saw the potential in creating a skin other people could use and enjoy and this really is the result of this. The fact that SOE own the intellectual property of both Everquest and Vanguard made a project like this possible. My plan was to try and see how much can you modify the ui without altering any xml files and only stick to image files. Just about everything i found out to my surprise. Sure there are some borders and text still using the "old" colors but i really think it fits in nice. I might release future addons dealing with the xml styles. Time will tell. I did attentionl leave out a few parts of the re-skinning process. First i naturally found parts that for different reason didn't needed to be reskinned. 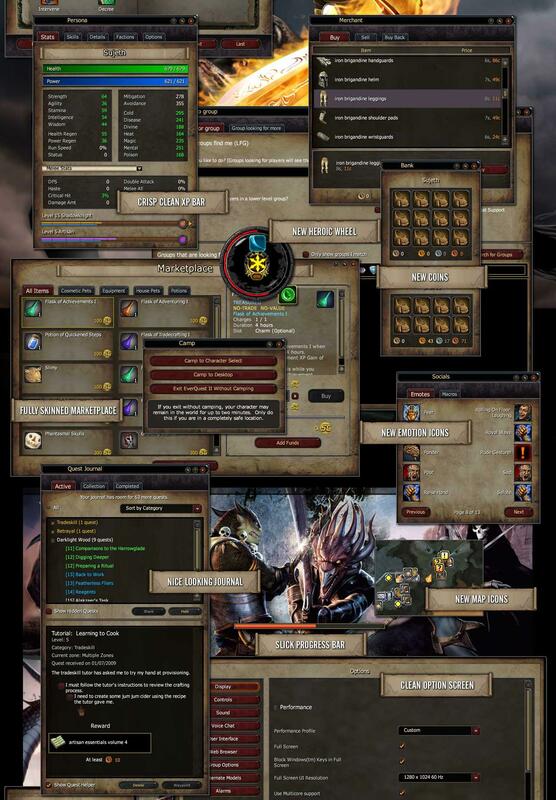 Other parts where the huge amount of old stuff still present in the ui files. I must admit it was quite difficult to know what parts that still where in use. Messy messy. Also, the fact that im pretty much new to this game meant i could only get visual feedback ingame from features available to me at low levels. I feel fairly convinced i missed some stuff but i just will have to go back and fix those in future releases. Let's talk a little about the new map system. I was glad to se finally a better system was created. although, the icons where too small and too complicated. Initially i was going to remake every icon but i realized that would take quite some time. Instead i focused my efforts on making the current one easier to differentiate. This had nothing to do with Vanguard but i felt i had to try to do something about it. And last, since you may be wondering, yes i did get permission from SOE to create a skin like this. Also this would be a good place to point out what great support and spirit SOE shows in letting us create stuff like this! Thanks again for the opportunity and support SOE! So, Say goodbye to the default skin and wasup VanGurK! Original artwork of Vanguard Saga of Heroes are the intellectual property of Sony Online Entertainment. I take no credit in the material used as a base for this skin. What i do take credit for is the insane amount of time i have spent to get this skin in a complete form. It's no matter of just copying an UI from one game to another but involves a lot of tedious precision work. Other than this i have also created all the Gaps and icons missing from the original material. The process of just figuring out what to go where took quite some time. This user interface skin is distributed 'as is'. I am not responsible for any damage or modification this skin does to your hardware or software, if you play Everquest 2 you ought to be tough enough to pick up the pieces yourself and to take full responsibility for your own actions. GurkoZ is not responsible for any harm or psychological affects, loss of vision, fatigue or general irresponsibility from playing with this new skin. The skin is 100% safe and tested, so you should have no trouble with it. But if you do, please don't blame me too much. The VanGurK Skin is freeware and can be distributed freely as long as the zip and it's content is not modified. If your looking to include this skin in your mod or a collection, please contact me first. Or at least leave me some kind of credit. I am doing this just for kicks and to honor a great game like Everquest 2! EverQuest® II © 2004-2013 Sony Online Entertainment LLC. Vanguard Saga of Heroes™ © 2002-2013 Sony Online Entertainment LLC. So I looked around a bit on this (the last comment being back in 2013 ) and at first, I just thought: "ooh hey a really cool Skin." And I've used it ever since then. But after a while I got to thinking, is this skin still getting updates? So I signed up on the spot, and got to typing this out to ask. Hey, awesome Dev person ^.^ I really like your mod for this game and I'm not sure if this is still a 100% working for the game here in the future of 2017. But Can I ask you if we can get an update of some kind? Pretty please?? Last edited by AlisterKID : 10-02-2017 at 07:50 AM. Hey! About time i visited this site again. Really sad to read that my skin is outdated but at the same time it's encouraging that people still looking for an new version. As i mentioned (a few years ago hehe) i no longer play Everquest 2, although that really shouldn't keep me from updating it. So, the other day i was talking to a friend of mine that started to play again and the memory of my old skin came back to me. I quickly installed the new Free to Play version through Steam and was up and running in no time. Did a few tests with the skin and sure enough it's pretty outdated. SOE added various stuff and moved things around resulting in "see through" invisible interface sections. Starting today, i am in the process of getting the files up to date. Have made some progress already and things look promising. If nothing big turns up i should have it ready for you guys in a couple of days. Mind you, since i don't play any longer i can only evaluate the interface on a basic level. What i can't do is make sure all raid and endgame related stuff is working. Hopefully someone can point out flaws that i miss. If everything goes as planned i'll be back with the v1.05 sooner than later. EDIT: Well, i am back and this time with an updated skin. I spent a few hours going over the files and incorporated the things that where missing. So now the skin should be usable as long as SOE don't add or move things around again. Time will tell how long that will take. Anyway, i only added the things missing and didn't really have the time to apply any custom Vanguard graphics to it. But trying it out i think it's not that big of a deal. Hopefully i can devote some resources in the future to enhance it further. Also, being a nut for details i did see a few areas where the buttons where broken. Although, the same skin used on other buttons and things looked fine, so in some remarks i blame SOE. Hope this will bring a smile to some players out there. I will try and check back in here more regularly in the future. Just wanted to say I just noticed you updated, so I've downloaded and installed. I love it, man. It's awesome. Thank you. I guess we can all assume that, after two years without an update after your last post, that this skin is no longer supported. Sad, I just decided to use it today and love it, but with XP and cast bars being invisible and no update in sight, I can't see continuing to use it or to recommend it to others. Last edited by gurkoz : 05-19-2013 at 09:43 AM. Nice to see you are still using my skin, and thanks again for all the kind words. I have to admit i don't really play Everquest 2 any more. By reading your comments it's obvious that SOE updated the graphics files related to my skin and a new version is required. I can't promise anything but i'll look into this and try to get a estimation on how much time this would require from my part. My problem is when I cast, I see no progress I only see the outline of the bar. I am having the same issue also with this skin pack. I'm going to start moving in and out files to see what happens. Hello! I just registered to thank you for this beautiful UI you've made. It's made it a lot easier on my eyes as far as gaming goes and it just looks really great. I hated the yellow everywhere and I have to say it's a breath of fresh air now that it's all gone. I have to ask about the Casting and Exp./AA/Tradeskill Bar tho. I'm sorry if this has been covered, I looked through and could not find anything that talked about them specifically. I may have missed it all together, reading stuff online can sometimes cause a small headache for me. My problem is when I cast, I see no progress I only see the outline of the bar. I also don't see any advancement on my Exp. Bar either. I wasn't sure if you had made the Exp. like that on purpose or not and that isn't a huge problem for me. The Casting/Air Bar is somewhat of a problem as I am a healer for my friend (we're really new to EQII and just run around together all day lol) and not being able to see the progress in the bar is a little frustrating. I would like for the background for my raid and group window to be solid black and not the gradient black at the top to clear at the bottom, can you give me a tip on how to change this? 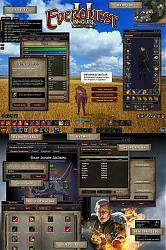 BTW, absolutely fantastic UI mod, I positively love it! Last edited by alugilac : 10-13-2010 at 09:13 PM. any way to get an option to use the new color schemes implemented with GU57 as well as your earthy colors? Please update, This BY FAR makes the experience that much better. With the Sentinels expansion, looks like some of the windows are not working. Specifically, the quest journal is missing the completed tab and the journal helper window is coming up with an error saying it's incompatible. Hopefully, this gets an update soon because I love this skin and would like to continue using it. This is by far the best skin i've ever seen!